Medal/Clasps: Queen’s South Africa Medal; Driefontein & Cape Colony Clasps. Above: Town & Country Journal - 7 Jul 1900, p21. Invalided soldiers on board the Australasian, Sydney, 29 Jun 1900. ​Pte Walter Finch is in the back row, third from the left. ​Below: The Sydney Mail & NSW Advertiser - 7 Jul 1900, p29. Invalided soldiers, Sydney. ​Pte Walter Finch is last of the right, second row. 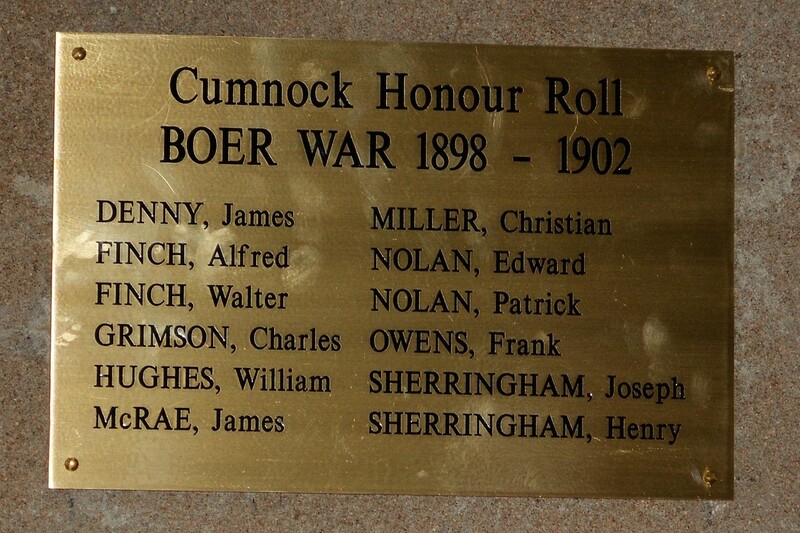 Above: Cumnock Boer War Honour Plaque, unveiled Anzac Day 2017. Walter Henry Finch was born in 1875 in Geelong, Victoria, and was the second son of Alfred and Isabella Finch, who married in Victoria in 1872. 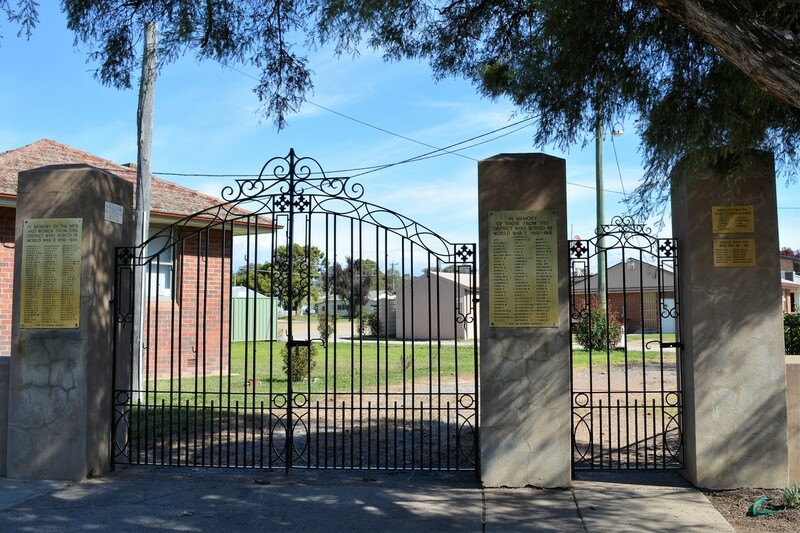 Alfred Finch and his family moved from Sale, Victoria, to Cumnock, NSW, around 1890, when Walter was 15 years old. Alfred John Finch bought William Black’s general store in Cumnock in December 1890, and advertised that he had a large and varied assortment of drapery, groceries, ironmongery, boots and shoes. Alfred became involved in many local community organisations, including the Cumnock Show Committee; the building of the Cumnock Hall in 1891; and the Cumnock Progress Association. In 1895 the Finch family bought the Beehive Store from Caleb Parker Junior, and William Black rebought Black Bros store. During the Boer War campaign Alfred Finch kept the Cumnock town folk informed of the progress of the British troops, while Isabella arranged for comforts for the invalided soldiers. Finch and Sons (Walter, Robert & Alfred) ran the Beehive Store until August 1906 when they sold the store to Mr A Barton. Alfred and Isabella moved to Sydney to live in 1906, where he died on 30 Dec 1915, aged 72yrs. Walter Finch was reported in the Molong Argus on 16 Oct 1896, p1, to have entered into business at Tomingley, in partnership with Mr McKinnon. “Wally” Finch of Cumnock was also reported as having almost recovered from a recent severe illness in the Molong Argus on 4 Dec 1896, p2 and on 6 Aug 1897, p3, as having “been very ill for the past week or so.” Walter served on a jury for the inquest into the death of a young Cumnock lad as reported in the Molong Express & Western District Advertiser on 29 Jun 1898, p3. Walter, his mother and sister Lily, were also reported in the Molong Argus on 1 Sep 1899, p4, as having been thrown off their sulky into a depression when their horse shied near the bridge opposite Mr Marston’s shop when returning from Burrawong. Fortunately, no one was hurt. When the Second Boer War started in South Africa on 11 Oct 1899, the British Army was reinforced by volunteer contingents from Canada, Australia, New Zealand, the Cape Colony and Natal. The first squadron of NSW Lancers were enlisted and arrived in Cape Town on 2 Nov 1899 to join the British force assembled there. By mid-December, the first two contingents of the NSW Mounted Rifles (A & E Squadrons) had arrived directly from Australia. A second contingent from NSW (B, C & D squadrons) embarked at Sydney on the transport Southern Cross on 17 Jan 1900 and disembarked at Cape Town on 19 Feb 1900. It comprised of 20 officers, 385 sergeants and rank and file, with 404 horses and 17 carts. Walter Finch was 25 yrs old when he enlisted in the 1st NSW Mounted Rifles, ‘D’ Squadron. James McRae from Cumnock was also a member of ‘D’ squadron. 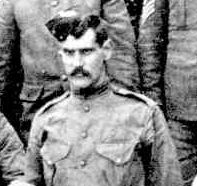 Walter’s older brother, Alfred, also enlisted, but from Capetown, on 11 Dec 1900, with the Commander-in-Chief’s Bodyguard. Walter wrote a letter to Mr WL Ross, schoolmaster [Cumnock], from Bloemfontein, on 21 March, which was published in the Molong Argus on 27 Apr 1900, p4. “I am dropping you a few lines as we have plenty of time on hand just now, being in camp here where we are likely to remain for awhile. It is just three miles across to the Free State capital, and a pokey bit of a hole it is. Well, to give you an account of how things are here. In the first place I suppose you heard that I had been shot, [On his first engagement with Le Gallais’ Brigade, Lord Roberts’ main column, Modder River to Bloemfontein, at Klip Drift on 6 Mar 1900] hit in the back while retreating; beastly luck, first engagement and all. There is no mistake about the Boer shooting — they can’t hit the side of a house. Just reckon, there were three hundred of us advanced to within nine hundred yards of a kopje where the Boers were entrenched and then when were ordered to retire they only potted nine of us. I got in one shot at a Boer on a grey horse; he won’t shoot any more Britishers. I had to ride twelve miles to get the bullet cut out, it was buried in the muscles of the shoulder and the doctor said that had it not struck the shoulder blade it would have been good-bye for me, but the old luck still sticks, I wasn’t born to be shot. I have the bullet with me and will get it mounted for a tie pin. I am having a fairly good time, no duties, nothing to do for another fortnight, can’t use my arm yet. We have had a very rough time of it — riding all day and leading our horses all night, and only one cabin biscuit per man per day. That is why we are camped here now spelling the men and horses. We haven’t half a dozen horses in the whole contingent fit to ride. The boys of the first contingent are with us. Chris Miller is in the hospital down with the fever, but is recovering slowly. Jim McRae is a bit sick on it but will not go to the doctor— it is better if a man can keep away from them. I don’t think we will be here much longer as Buller has taken all before him and expects to take Pretoria without any more help. If he does we will be ordered straight home. Nearly everybody here is full of it, nothing but starvation and hard work since the troops left Cape Town. Pte Walter Finch returned to Sydney with the second detachment of 23 invalided soldiers on the steamer Australasian. Private WH Finch was reported in the Sydney Evening News 28 Jun 1900, p6, as having enteric fever (typhoid fever) as did most of the other returned soldiers. The voyage was reported as a ‘pleasant’ one, with the men steadily improving over time and the soldiers praised the treatment received by Captain Spalding and ship’s officers. However, Surgeon-Major Tull, of South Australia, who was also suffering from enteric fever, died on 20 June and was buried at sea, with military honours. The Australasian was welcomed by ferry steamers while sailing up Sydney Harbour, and docked at Smith’s Wharf, Miller’s Point, at 7am on Friday 29 Jun 1900 to another enthusiastic welcome. The Royal Australian Artillery (RAA) Band played and a detachment of men from the RAA and Third Contingent acted as a guard on honour. After the soldiers were welcomed by officers and officials, they were examined by a medical officer, and had photos taken. The troopers left the ship around 11am in horse drawn carriages for a parade through the packed streets of Sydney and onto a reception held at the Victoria Barracks. The Molong Argus 13 Jul 1900, p2, records that a banquet to welcome home Trooper Finch was planned for Thursday 5 Jul 1900, but had to be postponed until the following evening, due to a heavy fall of snow on the Thursday. Although Friday was also bitterly cold, Cumnock residents turned out in great style to do honour to its local hero at the Cumnock hall. A number of speeches were made to which Trooper Finch made reply, songs were sung and then dancing continued until early in the morning. The Western Champion 11 Apr 1902, p8, reported “On the 2nd inst., Mr Walter H Finch, who has recently purchased Mr AG Jones’ tobacconist business, was married to Miss Ellen McDonnell, eldest daughter of Mr JW McDonnell, the popular host of the Commercial Hotel, Cumnock”. Walter was listed as a storekeeper in the 1903 Cumnock Electoral Roll (ER) but by then he and Ellen appear to have separated. WH Finch was reported in the Western Champion, 3 Apr 1903, p15, as having lost all his possessions when a room he was renting behind a shop owned by Mr G McFarlane was destroyed by fire in the early hours of 25 Mar 1903. There is also a news report in the Western Champion 3 Apr 1903, p11, of a trip WH Finch undertook from Parkes with a reporter to visit Cumnock. Walter was back in Cumnock in 1904, and was reported in the Molong Argus 8 Jan 1904, p7, as being ill with pleurisy. In the 1906 Cumnock ER, Walter is listed as an auctioneer. News reports around 1907 state that Ellen became the Postmistress at Obley. In 1910 she became seriously ill and died at her father’s [Mr JW McDonnell] house in Cumnock on the 6 May 1910. She was only 32yrs old and was buried in the Cumnock cemetery. Walter married Nellie Hudson in 1925 and the marriage was registered in Forbes. Walter Henry Finch died on 7 July 1926 at Manly, aged 51yrs. The Sydney Morning Herald, 10 Jul 1926, p14, states that he was the dearly loved husband of Nellie Finch, of Boomerang Farm, French’s Forest; and the dearly loved son of Mrs Isabella Finch, of Woodford [Isabella Finch died in 1936, aged 87yrs]; and that he was privately interred.